Cy Car Panikos is a Larnaca Car Rental company established in 1985 providing high services for tourism in Cyprus.Β We believe that our continuing success comes from our knowledgeable and careful service. From this point of view it is our pleasure to serve for travellers from all over the world. We are available to assist in the planning itineraries in Cyprus that will include all of your specific interests, and requirements. Then, when the planning is complete, we make all the arrangements necessary to ensure that your vacation runs smoothly as you wish. Our goal is to strengthen cultural relations and friendship throughout the world. 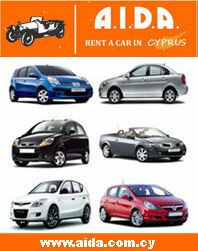 We are proud to provide travellers high quality services for Car Rental in Cyprus.